The King of Cups is a Court card, which means it can be read as an individual or as a situation/event. 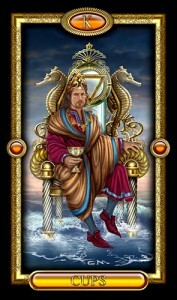 The King of Cups male is a man in his prime, who is interested or active in the arts or creative pursuits. He could be a psychologist, a writer, a chef or creative entrepreneur – whatever he does, it’s for the love of it as well as any financial gain. In touch with his emotions, he makes for a sensitive (sometimes too sensitive!) partner or collaborator. 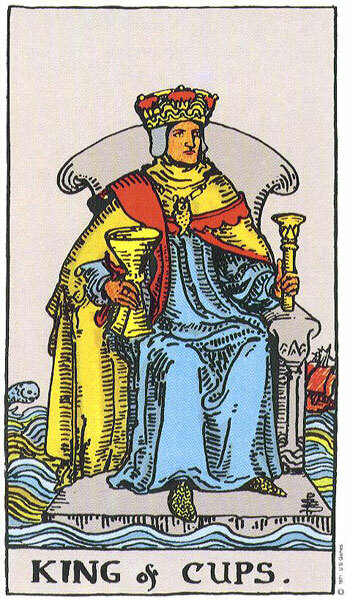 In a reading, this card indicates you are following your intuition (and perhaps divine guidance) and that you will experience success in creative ventures.